The DePaul University Department of English is proud to welcome writer, editor, teacher, and native Chicagoan Ian Stansel to the Lincoln Park campus next Monday as part of our Visiting Writers Program. Stansel is a graduate of the renowned Iowa Writers’ Workshop at the University of Iowa. He also holds a PhD in Literature and Creative Writing from the University of Houston, where he also served as the editor of Gulf Coast: A Journal of Literature and Fine Arts. Stansel’s work has appeared in a multitude of literary journals, including Ploughshares, Cincinnati Review, Memorious, The Antioch Review, and much more. 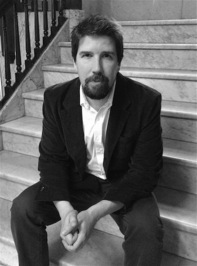 His short stories have also been included in both the 2012 and 2013 editions of the New Stories from the Midwest. Join us Monday, February 3 at 6:00 p.m. in Richardson Library Room 115 for what is sure to be a fun evening with one of Chicago’s own authors. In the meantime, check out Everybody’s Irish, Stansel’s short story collection published in October 13 by FiveChapters Books, and follow Ian Stansel on Twitter at @IanStansel.